Is Beautiful Space Always Creative Space? There was a recent article in the Australian Financial Review where the writer described an informal tour / interview with Tyler Brulé, editor-in-chief of the Monocle publication, of the Monocle offices. The writer described Brulé’s unrelenting attention to detail and almost tyrannical control over the visual landscape of the offices – going so far as to ban outside water bottles or having jackets slung over the back of a chair. The writer, who also writes for the Financial Times, described the Financial Times office as comparatively disheveled, but they publication they put out was still fantastic – essentially dismissing Brulé’s attitude. Now, you can imagine Brulé’s response to this could have been: imagine how much better the Financial Times could be if it was made in a beautiful location that uplifted the spirits of those who worked on it. It raises the interesting question: does being in a beautiful space result in better work? More creative ideas? More accurate conclusions? If the Monocle was created in a dungeon, would it become terrible? Interestingly enough, studies seem to point to messy desks stimulating clearer, more creative thought (see http://www.dailymail.co.uk/sciencetech/article-2088359/Messy-desks-office-actually-lead-employees-think-clearly-say-researchers.html and http://www.careeraddict.com/4185/why-a-messy-desk-means-you-re-a-genius). The reasoning goes that being surrounded by mess forces one to think more clearly and simply. It doesn’t make sense that beautiful space should be our ideal for everything except the places where we work. Alain De Botton discusses architecture’s role in uplifting our lives in his book ‘The Architecture of Happiness.‘ I will not here go into all the reasons why art and architecture and ‘beauty’ are important – I recommend reading De Botton’s book for that. ‘The Architecture of Happiness‘ puts forth an old idea, which supposes that what a culture finds beautiful actually relates to what that culture is lacking. In a way, this seems to support this idea of opposites, that, a clean space = a busy mind and a busy space = clean mind. Perhaps the most principal, least arguable point to take from this is that you need a variety of spaces in an office. If you believe this theory, then you will want to start creating spaces that balance what state of mind you want to be in. For example, at work clutter seems to just get injected into our minds with each email and phone call, so we want to simplify and clarify all our thoughts, a messy space prompts us to do this. However, at home, we don’t have this. We have much fewer cognitive tasks to perform. It is here where we are open to more maybe philosophical thoughts. More emotion. We don’t need the prompt to clear our minds so to allow our minds to flex and our thoughts to wander we need clean, simple spaces. 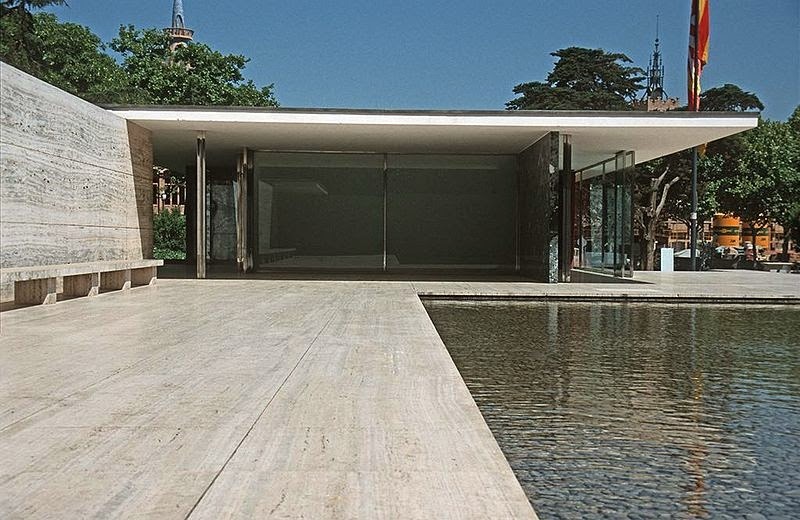 We need things like the Barcelona Pavilion.